Dark and visceral, the graphic novel version of Beowulf created by Gareth Hinds is considered to be one of the most successful adaptations of the Old English tale. First published in the year 2000, and then re-released as one-volume version by Candlewick Press in 2007, Beowulf by Gareth Hinds was the second graphic novel created by the 44-year old American-writer. He wanted to make use of some of the great stories from history, believing that they could be adapted for the comic book world. The success of Beowulf has led him to create more graphic novels based on Shakespeare’s plays, such as King Lear and Romeo and Juliet, and Homer’s The Odyssey. His most recent work is Macbeth, which was released in February. This version of Beowulf is heavily visual, with many of the pages not containing any text. While some of the story is told using the prose translation made by AJ Church, much of the action, including the famous fight scenes with Grendel and Grendel’s Mother, is told with just the images. When the story was first released in 2000, it was delivered in a three parts, each with a different medium – the first part was drawn with ink using a dip pen and brush, then colored digitally, while the second was done on wood panels and included watercolor, acrylic, and color pencil. 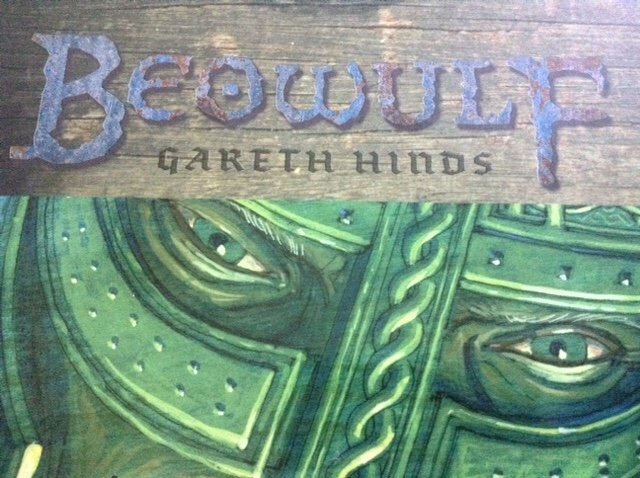 Recently, I added Gareth Hinds’ Beowulf graphic novel to the assigned reading of Seamus Heaney’s translation, and as I expected at this point, wonderful things began to happen. I had them read the text first and then the graphic novel; the emphasis I wanted to make was twofold: 1) compare the text’s description of Grendel and compare it to Hinds’ interpretation; and 2) compare the text of the battle to the wordless 22 pages of the comic that depicts those events. This opened the discussion, ironically, on the text itself rather than the comic, as students carefully tried to unpack Heaney’s translation of the poem. … Thus we can use the graphic novel as a means to engage the sometimes difficult language of the text. See also “Kid Beowulf” – A New Graphic Novel for Kids!